The analogy about the many rooms in my Father’s house, at least, was something that I could visualize. But I closed the Good Book ultimately feeling defeated, left without a proper explanation of what it’s like to exist and then to not exist, and what it’s like for those we leave behind. Maybe it was my fault. Maybe my faith wasn’t strong enough. I cracked open the closet door to watch for my parents, feeling crushed by a terrible secret. Much of this shame had to do with demographics. Churches are a dime a dozen in the Maryland panhandle, from the sprawling megachurches to the little single-story charmers—like the aptly-named Battlefield Bible Church near Antietam—that sprinkle the rural landscape. My father was a lapsed Catholic, my mother was a Lutheran who attended services with varying periods of regularity. Our household was not overtly Christian, but of course we were all baptized and prayed before meals. Of course there were decorative plaques with references to the Lord mounted on our walls. The only religious variation I was aware of growing up were our Jewish neighbors, who seemed just like us without the Christmas tree and Easter baskets. Church was fun during those early elementary school years when I accompanied my mother to her job as the minister’s secretary. I doodled on the backs of leftover bulletins and wrote stories on an old typewriter. I befriended the minister’s son and swigged communion grape juice with him in the supply closet. The churchgoers were jovial, reassured, filing into the parking lot with extra spring in their steps as the Sunday sermon worked its way through their hearts. But once we got a new minister from across the country, my mother became sad. She came forward that he was behaving inappropriately, and the congregation turned on her. I couldn’t understand how a group of people with such faith in an invisible man in the sky had none in a woman here on earth. “People believe what they want to believe,” my mother said softly. We found a new church. Lutheran, like I had been baptized, but a member of the Evangelical Lutheran Churches in America with a more contemporary atmosphere. We sang tracks from the Songs 4 Worship collections, which felt diluted and disingenuous in place of traditional hymns. We could wear jeans—“Come as you are.” My mother urged me to get involved with the youth group, a cluster of teens with “hearts on fire for Christ” who played electric guitar and listened to Switchfoot. Try as I did to muster up their unbridled enthusiasm for scripture and worship, I couldn’t, and faking it would have been insincere. I told Mom that I didn’t want to go back. “Are you an atheist now?” she asked, hands braced against our kitchen counter. 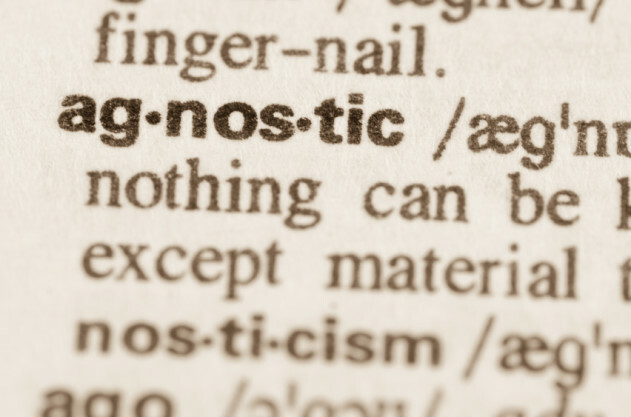 “Agnostic?” I recognized the look in her eyes. The tense, sad stare of a parent who wonders where their parenting went wrong. I told my mother about the prior week’s Sunday School session. September 11th still painfully fresh, the teacher had explained that those men flew planes into our buildings because they hated our freedom, our way of life, our Lord and Savior Jesus Christ. But we shouldn’t fear, because these events were a sign of Revelation, when Christ would come again and all our brothers and sisters would go to live with Him eternally. Back at the school library, I checked out the Qur’an and a few resources on the centuries-old conflict between Christians and Muslims. I learned that the major religions shared a common root: “But your name shall be Abraham,” God proclaimed in Genesis, “For I have made you the father of a multitude of nations.” In the 21st century, terrorists were crashing planes into towers and shooting doctors in their places of worship because they believed that God was telling them to. How did things get so mixed up? “It’s all right if you don’t want to go back,” my mother said. After college, I hid my agnosticism from my co-workers at the non-denominational Christian school where I was, ironically, the marketing director. When questioned about my faith, I stuck to the past as much as possible—“I was baptized and raised Lutheran,”—and, when questioned about the future, simply replied that I was on the hunt for a new church. Lutheran, I discovered, was insufficient here. Why wasn’t I born again, and would I like to join them for worship sometime? I occasionally attended services at the neighboring Unitarian Universalist church, which, full of progressive-minded parishioners from all kinds of backgrounds, soothed and inspired me. Each week, I left with faith—faith in humanity. This contrast brought me to understand that our concepts of God are as diverse as we are. I came to know many Christians who do incredible work in the name of the Lord, whose kindness and generosity would, if there is a higher power, no doubt be worthy of its praise. But I also met many Christians who used selected scripture to substantiate their own ugly agendas. While walking to my car one evening after work, I was stopped dead in my tracks by a child’s drawing taped to a classroom window. In blocky blue crayon were scrawled the words “No Homosexuality,” accompanied by doodles of two men and two women holding hands under angry red “NO” signs. I sat at the steering wheel with my head in my hands, thinking of the warm and loving transgender woman in our Unitarian Universalist congregation who would be met here with nothing but scorn. As far as I’m concerned, all the rest—from the intricacies of a butterfly wing to the vibrant splash of a sunset—can remain unknown.